Opel/Vauxhall 2.0 XE ( Red Top) throttle body kit from Jenvey Dynamics includes a pair of TB45 throttle bodies (ITB’s), a Jenvey Dynamics EFI inlet manifold, fuel rail and four 90mm long airhorns. 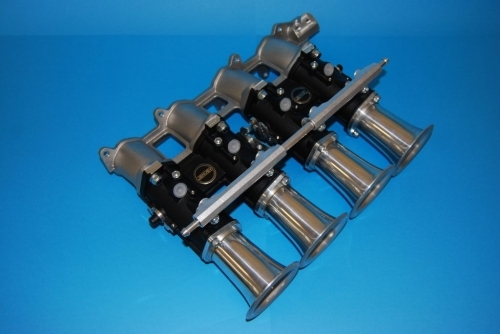 Jenvey throttle bodies and all Jenvey throttle body accessories are engineered for Motorsport, offering excellent performance, reliability, lightness and value. This kit is ideal for road, track or rally use. Suitable for a front engine rear wheel drive car where the engine is upright and the throttle bodies are horizontal. This engine was from the original 16v Astra and GSI Cavalier and is used widely in Kit cars.